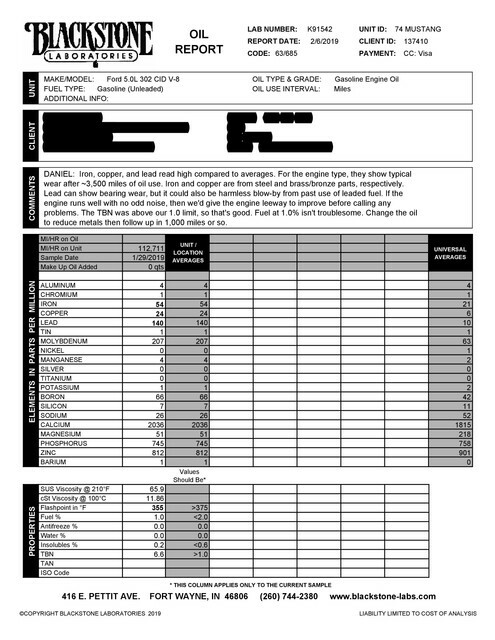 As offered in an earlier thread, below is my oil report which I just received from Blackstone Lab's. Thought the car is a 73 and they list it as being 74, the report also indicates I have high levels of Iron, copper and lead. This car was a new purchase last year and she came out of Virginia, so we were not sure what to expect and/or if a rebuild is required. If anyone wishes to comment on the values, I'm all ears. Blackstone was very easy to work with if anyone is interested. It's almost like the first test isn't the baseline -rather the difference between the 2nd and 3rd. Personally leakdown, compression along with emmisions (if you have access) would be the starting place. These are the efficiency factors oil pressure in relationship to temperature would tell a different area. (Read: ware) Good for you for not just "running to I'm going to rebuild my engine". There is alot to learn ! Holy cow, this report looks like the ingredients in one of my Silver Centrum vitamin supplements. . . well except for the lead. Very difficult to make any determinations from the oil test without knowing a lot more about the car. How long was it in storage, was the engine ever rebuilt, in other words a complete history of the car. For instance, if the last time it ran leaded fuel was still available. Like Mark said, the old stuff needs to be flushed out before you can even consider one of the tests to be a baseline that can then be used to compare future tests against. exactly what oil is it? how many miles on the oil? it doesn't have much zinc, so i would check to see how much zinc the oil has when it is new, and if it has around the same amount, i would consider using some other oil. Thank you to all and I'll be checking the new oil ingredients before I add it. Next step; pressure test (stress test). I'll post those results along with the leak-down also.